In the years following WWII, Nazi officers who fled Germany after the war were often tracked down and forced to stand trial for their crimes against humanity; one of the most elusive was Adolph Eichmann (Ben Kingsley), the Architect of the Final Solution. When the Israeli government learned of Eichmann’s whereabouts in the early 60’s, a task force of special agents led by Peter Malkin (Oscar Isaac) was assembled to bring him in; a task that would require an extraction from Argentina, a hostile territory and hotbed of post war Nazi sympathizers. Based on actual events, it’s a Mission Impossible that’s almost stranger than fiction, this is that story. Written by Matthew Orton and Directed by Chris Weitz this Argo-esque dramatic thriller finds itself strapped between history lesson and action film, but doesn’t fully embrace either genre; end result a bit underserving for those looking for either. Regardless, Isaac and Kingsley step each other’s game up exquisitely making for a number of great exchanges; the rest of the ensemble handle their parts aptly as well without a sour grape in the bunch. Score by Alexandre Desplat also manages to add richness and flavor by faithfully blending cultures and melodies with well chosen instrumentation adding further spirit. 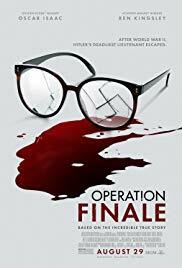 Worthy of your time as at least a Matinee, Operation Finale is rated PG-13. Chased out of Detroit by a money hungry and vengeful criminal named Taylor Balik (James Franco), Young Eli (Myles Truitt) is harbored by his stepbrother, Jimmy (Jack Reynor) who’s fresh out of prison. But each new turn brings about more trouble, that is until Eli learns to wield a strange space blaster found in a decrepit warehouse; then again, new troubles, trading bad choices for worse, it’ll take interstellar involvement to set the boys on the right path. Written and Directed by Jonathan and Josh Baker this young adult adventure deals with a host of heavy topics but specifically looks at moral compassing, what it means to be be responsible adult, to do the right thing and the importance of family. Overall, there’s a lot to like about the messaging and story, standard as it may be, and the three leads are all well positioned and acted, Franco in particular sinks his teeth into skeezy evil like no other. And, setting up for a potential franchise, the nuts and bolts seem to be mostly in place; however, the biggest challenge outright for Kin appears to be hitting the marketing path just right. In the meantime a continued search for the next “big thing” is clearly what’s going on here, it’s tough to say if we’ll see the next chapter. Kin is rated PG-13. 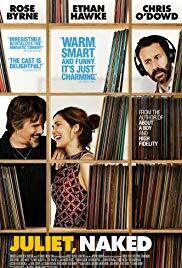 Annie (Rose Byrne) is a museum curator for a small English coastal town, she also happens to be in a long term relationship with Duncan (Chris O’Dowd), a college professor with an obsession for cult rocker Tucker Crowe (Ethan Hawke), the obscure and mysterious artist who vanished into the wilds of America just as he was reaching his peak over 20 years ago. Strained and split, Annie and Duncan find more to argue over when Annie finds herself face to face with the elusive Tucker Crowe. Second chances in life for all, but not all will be redeemed, where exactly will the pieces fall? Based on Nick Hornby’s novel, with screenplay by Evgenia Peretz, Jim Taylor, and Tamara Jenkins and Directed by Jesse Peretz this endearing semi-romantic comedy does a fine job allowing the ensemble to play to their strengths, Byrne’s honesty and pure likability, O’Dowd’s ability to conjure the awkward and self absorbed buffoon, and Hawke’s middle-aged rockstar sensibilities. Simple in its overall construction Juliet, Naked sits in the category of plausible and earnest storytelling; and, while it’s not about high zany laugh counts, the film is more about spending an hour and forty five minutes with several flawed but fun and interesting characters– success. Worthy of a matinee or perhaps waiting for that winter snuggle up and feel good type flick, you’ve got a match. Juliet, Naked is rated R.